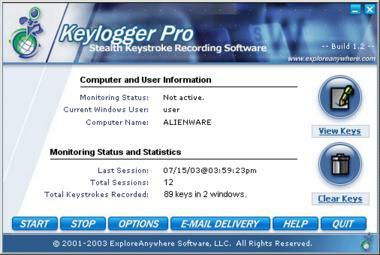 KeyloggerPro is an advanced, low level stealth keystroke monitoring application that will secretly record and backup all keystrokes typed on your PC. It offers a wide variety of features including the ability to view keystrokes remotely by having the program send keystrokes to a specified email address every X hours. 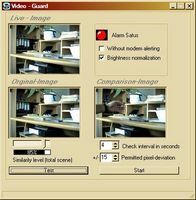 KeyloggerPro can run in total stealth mode for invisible monitoring or with an optional warning screen, making the user aware of the monitoring taking place. You can limit logging to selected users, set monitoring schedules and more. Additional features include an intrusion detection option that attempts to bypass spyware scanners. KeyloggerPro is perfect for monitoring spouses, children, employees, or even yourself to keep a safe backup of everything you type on your PC.